The beauty of the region in Kashmir is well known all over the world. Its pristine natural surroundings, beautiful lakes - the region is also called as ‘Paradise on Earth’. Kashmir truly is a beautiful place to visit. Apart from the quintessential houseboats, little does anyone know it is also home to beautiful hill stations. TravelHot has a number of packages to the Kashmir Valley. You will find a lot of hill stations to visit throughout the country, the scenic wonder that is Kashmir has much to offer to the ubiquitous traveller. Even if travelling for the very first time, your visit will memorable. 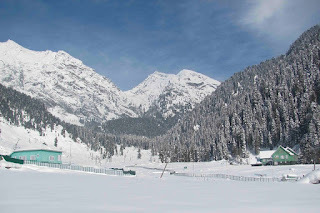 The best known of all the hill stations in the valley: Srinagar, Pahalgam and Gulmarg. This first thing that travellers will notice about this enchanting destination is the climate – which is colder than most parts of the country. Temperature can plummet to -20 degrees. What Srinagar has to offer is the Shankaracharya Temple, Dal Lake and Zabarwan Mountains among many others. You can arrive here at Srinagar International airport, also known as Sheikh ul Alam Airport. You can travel from here to various other part of the valley by road. Pahalgam is another sought after tourist destination for many. Two things come to mind about this place: one - it is the starting point of Amarnath Yatra. Second- the area is rich in vegetation, natural surroundings and animal life. One of the major reasons to visit Pahalgam during the summer is that it is an off season. You can expect better deals on hotels. The town is well connected to other parts of the valley. The last hill station on our list is Gulmarg. Like Pahalgam, Gulmarg is also a town and a popular skiing destination. Besides a ski resort, the town has also lots to offer in the form of cable car riding, horse riding, hiking and many more. It may come to you as a surprise that Gulmarg also has the highest golf course of the world.